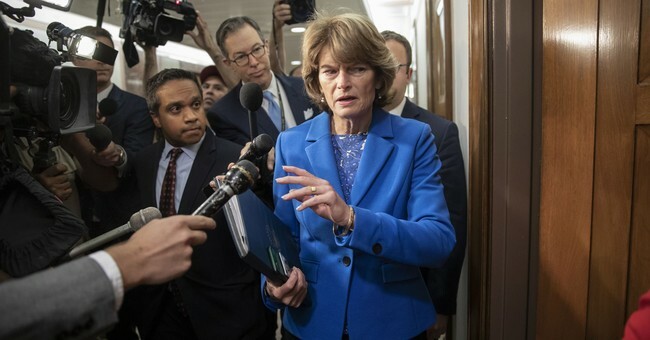 Sen. Lisa Murkowski (R-AK) told reporters Friday that she agrees with fellow moderate Republican Sen. Jeff Flake (AZ) in his call for an FBI investigation that would delay the Senate floor vote on Supreme Court nominee Brett Kavanaugh’s nomination for up to one week. During the Senate Judiciary Committee vote to move Judge Kavanaugh’s nomination to the full Senate, Sen. Flake insisted that he did not think they should have a full vote on Kavanaugh until there has been a week-long FBI investigation into sexual misconduct allegations against Kavanaugh. The committee did vote 11-10 to confirm Kavanaugh, moving his nomination process to the full Senate. As a moderate Republican, Sen. Murkowski is a key vote in the confirmation process. Key moderate Sen. Joe Donnelly (D-IN) announced this morning that he was a "no" vote on Kavanaugh. Kavanaugh's confirmation will be determined by her and other moderate senators such as Sens. Susan Collins (R-ME), Joe Manchin (D-WV), and Jeff Flake. Judge Kavanaugh and Dr. Christine Blasey Ford both gave emotional testimonies Thursday on allegations that he groped her and pinned her down while he was drunk at a party in high school. Kavanaugh fully denies her allegations and the witnesses she initially claimed were present have denied that such an event occurred.